I always enjoy restaurants and bars that really try to go for an authentic as you can get style with food and decor. 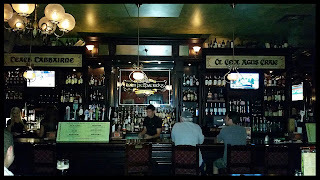 When it comes to Irish food in Orlando and surrounding areas we have a few smaller locations like Harp and Celt that do a decent job at providing that atmosphere and traditional food cravings from the homeland. Of course there is the larger Raglan Road at downtown Disney and Meg O'Malleys Irish Pub in Melbourne FL, but I have yet to find somewhere in between these until I visited Liam Fitzpatrick’s. 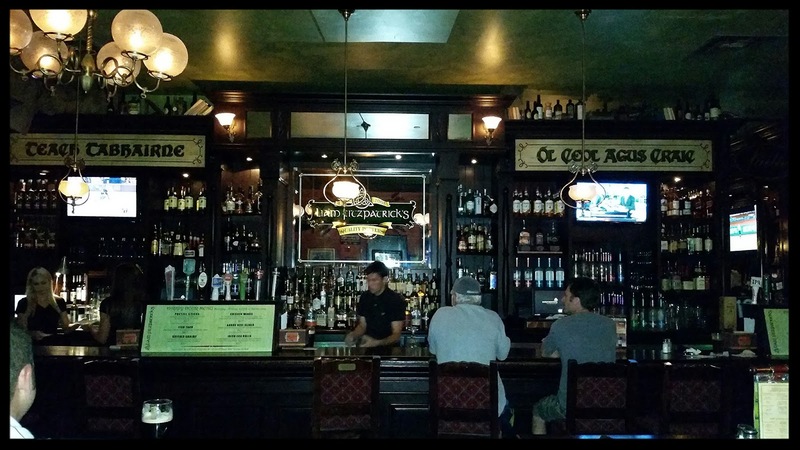 Located at the Colonial Town Park Shopping Center in Lake Mary, Liam Fitzpatrick’s, is carrying on the two hundred year old tradition of a great Irish Pub with a hearty mix of great food and drink, warm and friendly hospitality, good music and great conversation. Liam’s was inspired by the owners visits to Ireland and by the wonderful times they experienced there. Their desire was to bring the spirit of that great culture of food and friendship to Lake Mary where upon stepping through their doors you can feel as though you are with friends and ready to enjoy a great time. Outside of Liam’s, you will be drawn in by the classic exterior, which resembles a traditional Irish pub. Once inside, the Irish pub decor takes things up a notch with elaborate rich wood furnishings and accents. Two separate pub areas, front of house and back, offer fully stocked bars with perfect pours of Guinness or whatever you may be in the mood for. The inside is very spacious and open with plenty of seating. There is also a private dining room which is available for pretty much any type of event you would like to have. Liam Fitzpatrick’s is lively and festive at anytime of the day. There is live music almost any night of the week and Saturday nights feature dueling pianos. There are yearly block parties which include St. Patrick’s Day, Halfway to St. Patrick’s Day, Halloween, New Year’s Eve and many more keeping Liam’s largely involved in the local community and always a happening place. The menu here consists of your traditional Irish favorites like Shepherd's Pie, Corned Beef & Cabbage and Fish & Chips. However, the creative team at Liam’s, has put together some additional mouth watering items with an Irish twist. Some of these items include the Galway Burger, an Irish Cheese Steak, Curry Chicken and Lobster Mac & Cheese. Of course it goes without saying, Guinness and a selection of other craft beers and cocktails are available to help wash down all of this delicious food. The Baileys Irish Coffee is a great pick me up at the end of your day, and a “Perfect Pour” of Guinness in a proper 20 ounce tulip pint glass is sure to satisfy your thirst. Scotch Eggs are pretty common to find at most Irish pubs, but Liam’s has spiced up this classic appetizer by rolling the eggs in chorizo sausage before breading them. This was a unique twist that I really enjoyed. Although not a “traditional dish” the Apple Walnut Salad was outstanding. This salad is made with baby spinach, walnuts, apples, goat cheese, and dried cranberries tossed in a raspberry vinaigrette. For an additional charge, you can have grilled or blackened chicken or shrimp added to this salad. We opted for the blackened shrimp, and the savory flavors blended well with the sweetness of salad. The Corned Beef and Cabbage is roasted in beer for ten hours and is served with cabbage, boiled red potatoes and a horseradish Dijon sauce. This is a proper fish & chips with jumbo pieces of haddock fried in special recipe batter served with tartar sauce and mushy peas. The Shepherd’s Pie at Liam’s is made with a blend of ground beef and lamb with carrots, onions, peas, celery and corn baked with a cap of mashed potatoes. For an added bonus, you can have them top it off with melted cheese. For an Irish American twist, the Galway Burger is Angus beef, topped with Irish Whiskey glazed onions, lettuce, tomato and imported Irish porter stout cheese (which sometimes doesn’t make it through customs) and Guinness BBQ sauce. This burger is loaded with flavor and does not disappoint. You can get a number of side items with this burger and we chose the sweet potato fries. Bread & Butter Pudding is a traditional Irish bread pudding made with raisins, served with whiskey creme anglaise and is ridiculously good. The Baileys Cream Cheesecake is a signature cheesecake made with Baileys Irish Cream, topped with chocolate and caramel. It is very rich but very delicious. Whether it’s a business lunch, a gathering with old friends or a celebration with new friends, Liam’s provides a great setting for your visit. With a wide ranging menu of great home cooked food to suit every taste and pouring some of the best beers and wines in the world, Liam Fitzpatrick’s delivers an authentic Irish experience in warm hospitality that can only be described as brilliant! Enjoy Brunch every Saturday and Sunday from 1030am – 3pm with endless Mimosas, a unique selection of Bloody Mary’s and Fitzpatrick’s Brunch Favorites. Ever since the Orlando Eye announced plans to open on International Drive, businesses and restaurants alike were in a hurry to open up shop and get in on such a great attraction that was sure to draw customers and plenty of tourists. Over the past year during the construction of the eye, and since its opening, there have been quite a few restaurants to open, and I can tell you with certainty, a few more are still in the process of being built. I have had the pleasure of dining at almost all of those restaurants that are filling up the I-Drive complex that hosts the Orlando Eye, but Mcfadden's took me a little longer to get around to, so with haste, my sister and I made an appointment a few weeks ago to check out one of the newest tenants to the attraction. McFadden’s is a franchise of sorts with 15 locations throughout the U.S. The original location was founded by an Irishman himself... Steve McFadden. That restaurant was established in New York City in 1977 and was called McFadden’s Restaurant and Saloon, after the owners namesake. it is rumored that over 35 years later you can still find Steve enjoying a pint at the historic mahogany bar at the NY mainstay on the corner of 42nd and 2nd street. 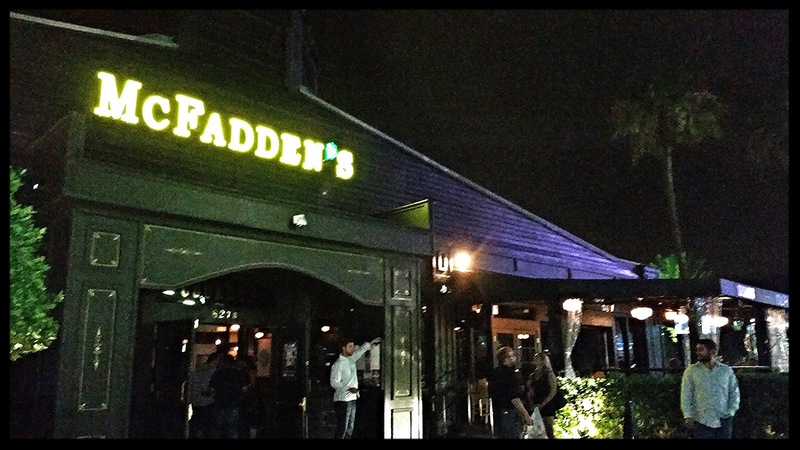 McFadden’s has maintained its traditional Irish essence while establishing itself as a respected restaurant, after work meet up destination, and the ultimate party bar at night. When the lights go down the party turns up. With an attractive and fun staff, customers are always guaranteed to have a good time. Through special events, theme nights, drink specials and live DJs there is something to celebrate every night at McFadden’s Restaurant and Saloon. McFadden's Orlando features two outdoor patios, HD TVs for the ultimate sports viewing experience, and a delectable food menu featuring authentic Irish fare and American comfort food like gourmet burgers and signature appetizers and a mouth watering drink menu that features famous Fishbowl drinks. Although it’s certainly not an authentic Irish creation, I could not refuse the Bacon Wrapped Onion Rings. Pretty simple beer battered rings, wrapped in bacon and served with a spicy ketchup for dipping, and yes they were pretty tasty because Bacon. One of the many cocktails I sampled was the Mcfadden’s Mai Tai with Don Q and Myers Dark Rum, Grenadine, Orange Juice and Pineapple Juice. Of course we had quite a few Pickle Back shots as well. For something more authentic, my sister ordered the Shepherd's Pie made with ground beef, vegetables, mashed potatoes and a red wine reduction. This was actually quite tasty, and spot on flavor wise. Once again, I saw something strange on the menu that I had never eaten before, so I had to order the Chicken and Bacon Pancakes. This is two gigantic pancakes stuffed with fried chicken, bacon, smothered with sausage gravy and topped with maple syrup. It actually worked well together, but proved to be a bit more than I could eat in one sitting. Although my heart was set on the bread pudding, my sister insisted on the Chocolate Lava Cake. This was a warm and gooey on the inside chocolate cake drizzled with chocolate sauce and served with ice cream. It was a good ending to a fun night. The service was fast and attentive and we enjoyed all of our food and drinks. We arrived around 8:00 pm and found that as it got later in the evening, more people were arriving to get their party on. By the time we left, half of the restaurant was in full club mode full of young and old alike all enjoying themselves.